datapine’s software enables you to connect all the data sources of your organisation in one centralising place. With an easy all-in-one data integration, non-technical users can enjoy the possibility to work from various data connections with a quick access to all the information needed to perform their analyses. 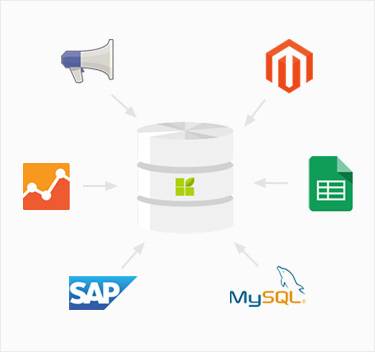 Databases, flat files, social media data, APIs, CRM- and ERP data and other platforms can be connected to our data warehouse and you can manage them all at your will: merge, update, add, edit… all is in your power. We live in a data-driven world, where the overwhelming numbers of channels scattered through departments and disparate systems cause a challenging environment to collect, analyse, share and make intelligent business decisions to obtain a sustainable development and profitability. That being said, data silos are one of the most common issues companies face – an average business uses up to 13 different applications that result in disperse communication between departments, causing poor exchange of information, disruption in systems and processes, leading to inadequacy to meet business goals and clients’ needs. Creating a centralized approach to data is still a challenge in business operations and strategies. 1) Improving the decision-making process: Accessing your data in real-time, presented in easy to digest interactive business dashoards, providing management and co-workers a transparent way of reporting is an invaluable acumen to take advantage of and identify potential issues before they occur. 4) Improving customer experience: A complete overview of customers is crucial to obtain and analyse since the customer is the building block that drives revenue. The historical data that can be used to target your customers with the right message at the right time will help increase loyalty, the overall customer experience and, ultimately, revenue. 5) Predicting the future: Anticipating customer demands based on historical data gathered with seamless data connector integrations will enable you to generate forecasts and predict customer behaviour.